Viktor Gonchar was born on September 7, 1958 in village Rodichevo of Minsk Oblast. Obtained a degree from Belarusian State University. Lawyer, candidate of jurisprudence. Worked as senior research fellow at Institute of Philosophy and Law of the Academy of Sciences of Belarus, senior lecturer at Belarusian Economic Institute, head of economic/legal department of the State Economic Planning Committee, first deputy chairman of the Molodechno City Executive Committee, deputy Prime Minister of Belarus, general secretary of the Economic Court of the Commonwealth of Independent States, chairman of the Central Electoral and Referendums Commission. 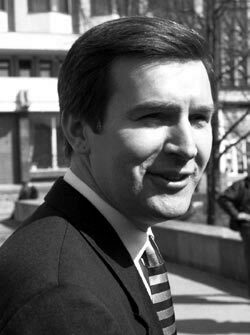 From 1990 to 1995 was a deputy of the Supreme Soviet of Belarus. He also held the post of first deputy chairman of the Supreme Soviet of Belarus of the 13th Convocation and that of chairman of the Central Electoral Commission. During the 1996 constitutional crisis took active part in the activities of the Supreme Soviet. In May 1999 headed the presidential elections campaign. In July of the same year made an official statement about the end of Lukashenko's legal presidential rule. On July 21, 1999 elected acting chairman of the Supreme Soviet of the Republic of Belarus by deputies of the Supreme Soviet of the 13th Convocation. 1999 was a year of bitter confrontation between the Lukashenko regime and opponents of the imposed by him on the 1996 referendum new version of the Constitution that fixed among other things a new date for presidential elections. Political forces that did not recognize the modified by Lukashenko Constitution and his claims to remain in office until 2001 had an unwavering purpose in the course of the struggle against the regime to hold the elections in 1999 as was predetermined by the first Constitution of independent Belarus. A considerable number of Lukashenko's opponents closed the ranks around the Supreme Soviet of the 13th Convocation. Before the 1996 referendum that dissolved this supreme legislative body of the country, the Supreme Soviet did not represent specific political views. It embodied the Law and was a serious obstacle for Lukashenko to gain unlimited power. Thus, the Supreme Soviet of the 13th Convocation denied Lukashenko’s demand to extend his term in office to seven years and modify the Constitution to extend power of the executive branch. The 1996 referendum initiated by Lukashenko in order to crush the resistance of the legislature was held with violations incompatible with fundamental legal regulations. Since then Lukashenko perceived the figure of Mr. Gonchar, deputy chairman of the Supreme Soviet, as his direct political rival. The danger for Lukashenko posed by the activities of the opposition that in 1999 fixed the purpose of alternative presidential elections had nothing to do with stripping him of the prolonged term in office. The opposition had an effective instrument to destroy the Lukashenko regime as a house of cards. To hold presidential elections ignoring the imposed version of the Constitution meant to catch the regime on the spot of its first grave crime, to publicly prove the illegitimate nature of its rule. Lukashenko was aware of this danger precisely because the 1996 referendum was designed by him as a means of absolute usurpation of power in the country and a guarantee of perpetuation in office. Therefore the solidity of the danger for Lukashenko posed by the political forces united with the Supreme Soviet of the 13th Convocation cannot be overestimated. Viktor Gonchar, deputy chairman of the Supreme Soviet of the 13th Convocation, Lukashenko’s irreconcilable opponent, a generally recognized opposition leader, and his friend, prominent entrepreneur Anatoly Krasovsky who financed the opposition movement, drew close attention of special services responsible for the regime's security. Viktor Gonchar and Anatoly Krasovsky were put under surveillance, their telephones bugged. The tragedy was set to happen on September 16, 1999. In the afternoon of that day Anatoly Krasovsky and Viktor Gonchar were abducted. The law enforcement agencies started investigating the case; however all known to date evidence has been collected by volunteers. That includes windscreen fragments of Mr. Krasovsky's car used by the friends that day found on Fabrichnaya Street in Minsk, traces of blood identified as Mr. Gonchar’s by an independent expert examination. These and other evidence clarify the details of the abduction and are recognized by general public as a proof of direct involvement of security services. The official investigation, despite the fact of permanent surveillance over Viktor Gonchar and Anatoly Krasovsky conducted by the KGB, announced that the case could not be solved. After Mr. Gonchar and Mr. Krasovsky disappeared the KGB issued a statement claiming that surveillance was suspended precisely on September 16. In June 2001 the testimonies of KGB investigators Petrushkevich and Sluchek became known to the world community. They told some details of the system of physical removal of the unwanted in Belarus that has taken shape since Lukashenko came to power. Photographs of Viktor Gonchar (1).